Anders Breivik’s minute by minute account of how he slaughtered dozens of teenagers at last year’s Norwegian Labour Party summer camp makes sickening reading. 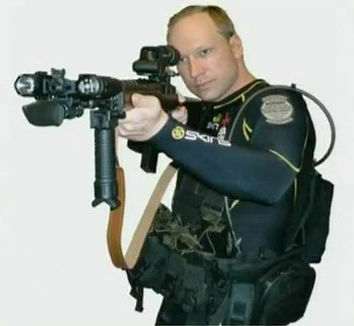 Breivik’s trial has given rise to much debate about whether he is sane or not, whether he acted alone or is part of an organised fascist network, or whether he should be allowed to use the Oslo court as a platform for his political philosophy. The murders committed by Mohamed Merah in Toulouse were on a smaller scale but they were no less chilling: in the playground of a Jewish school a heavily armed man picks out a teacher and three small children and guns them down at point blank range. Merah, of course, was not given a platform to expound his philosophy: he was killed by police marksmen after a short siege. There has been considerable speculation about this also, with some arguing forcefully that he was a double agent working for French security (http://www.ilfoglio.it/soloqui/12779). There are obvious differences in the way the two cases have been handled. In The Guardian of 21 April, Jonathan Freedland points out that as a general rule Islamic terrorists, even when they are kept alive, are not usually given the chance to explain their motives as Breivik has been. And on the face of it, ideologically, far rightists like Breivik and jihadis like Merah are polar opposites; Breivik’s obsession is with the threatened ‘Islamification’ of Europe, while the jihadis claim not only to be acting in revenge for attacks on Muslims in Iraq, Palestine or Afghanistan, but for the creation of a global Caliphate ruled by Sharia law. But what is most striking about the Islamophobics and the jihadis is the similarity of their ideology and their practices. For a start, in court Breivik expressed his admiration for al-Qaida’s method of organisation through small decentralised cells. It has been suggested that this is a model which groups of the far right are increasingly turning to. Breivik also praised al-Qaida’s ruthlessness and spirit of self-sacrifice in the service of a higher ideal. And when you look at their respective ideologies, they also have a great deal in common. Both are deeply racist: the rightist hysteria about the Islamification of Europe is just the latest version of the ideology of White Christian Civilisation threatened by hordes of dark-skinned foreign invaders. At the turn of the 20th century the main threat was presented as the Jews fleeing the pogroms of Russia; a few decades ago it was the black and Asian immigrants brought in to do jobs at lower rates than ‘native’ workers; today, racism has had to cloak itself in the colours of anti-Islam because overt anti-semitism and anti-black racism are far harder to sell to a population already accustomed to a much more diverse social environment. The English Defence League even has Jewish and Sikh members, united (for now) with white stormtroopers by their hatred of the ‘evil religion’ of Islam. But behind all this is same morbid ‘Aryan’ world-view born as a justification for the imperialist expansion of European and American capitalism from the late 19th century onwards. But the jihadis are no less racist. When it first emerged, Islam, like other monotheistic religions, expressed, in ideological terms, a real tendency towards the unification of humanity beyond tribalism. It was thus open to all ethnic groups and maintained a respectful attitude to the Jewish and Christian religions which it saw as bearers of a previous revelation, But today’s jihadism expresses another historic reality: religion, in all its forms, has become a force for division and the maintenance of a decaying social system. In the mind of the jihadis or Taliban-type groups, the ‘kaffir’ (unbelievers) are indistinguishable from ‘foreigners’, while the Jews are no longer the People of the Book but the evil conspirators of Nazi paranoia, and Christian churches are legitimate targets for bombs and massacres. This doctrine of division is even extended to the followers of Islam – al Qaida in Iraq and Pakistan has probably killed more Shia Muslims than members of any other group. Their hatreds may be directed at different groups, but both the extreme right and the jihadis are implacably opposed to any real movement for the unification of mankind. Breivik and al-Qaida also share the same conception of morality: the end justifies the means. For Breivik, the teenagers he murdered were not innocent because they support a party that imposes the evil of ‘multiculturalism’. But above all they were killed with the intention of sparking off a race war that would lead to the ethnic cleansing of Europe and a new Christian-Aryan millennium. For Merah, small Jewish children can be shot in the head because Israeli jets have killed many more Palestinian children. For Bin Laden and his ilk, killing thousands of civilians in the Twin Towers is a justified response to what the US has done in Afghanistan or Iraq, and will serve the end of rallying the world’s Muslims to the banner of Holy War and the new Caliphate. Of course many liberals will make similar points to ours – it’s part of their argument that ‘all extremes meet at the same point’. But the most visible extremists are the tip of a much bigger iceberg. Underneath Breivik are all the EDL-types and ‘populist’ politicians like Le Pen in France and Wilders in Holland who take the line “I don’t agree with his methods, but he definitely has a point about the threat of Islamification.....”. And underneath them are the mainstream tabloids whose headlines ceaselessly scream about the Muslim terrorists in our midst, the mounting flood of asylum seekers, while the ‘respectable’ politicians compete with each other to show how tough they are on immigration and are, after all, in charge of the state that deports asylum seekers fleeing the worst miseries of the present system, or bangs them up in detention camps. Likewise jihadi ideology is only the child of the official ideology of the Arab states who have long used anti-Zionism and a perpetual state of war with Israel as a way of diverting the anger of the masses from their own corrupt and dictatorial practices. And ‘radical Islam’ also has its ‘revolutionary’ apologists – Galloway, the SWP and the official left, whose response to the latest jihadi atrocity is also “I don’t agree with their methods but...” because they share the same notion that the USA and Zionism are Imperialist Enemy Number One and see Hezbollah, Hamas, and Iraqi or Afghan jihadis as expressions of ‘anti-imperialism’. All this is the ideological excretion of the real processes at work in contemporary capitalist society: the never-ending drive towards imperialist war, which has become increasingly chaotic and irrational as the system decomposes. The war of each against all, of race against race, of religion against religion, of state against state, is a process which is the most real and devastating threat facing humanity today – the threat of a slide into barbarism and self-destruction. And the liberals who decry extremism and bleat about their humanitarian values don’t represent an alternative. They justify the terror bombing of Japanese and German cities at the end of the Second World War, and indeed the whole nightmarish catastrophe of that war, because it was a means to establishing democratic post-war capitalism. The only worldview that stands in opposition to these ideological divisions is working class internationalism: the simple idea that the exploited of all nations and religions have the same interests in combating their exploitation and their exploiters. This is a combat whose end is the real unification of humanity in a stateless, global community. And it is a combat whose means can only be consistent with its ends. It seeks to win over those caught up in the ideology of the exploiters by demonstrating the need for solidarity, not massacre them as unbelievers. It rejects the practice of indiscriminate revenge and mass murder because it knows that these methods can never result in a establishment of a human society. Yes, the class struggle is a form of war. But the class struggle is truly the war to end war because its aims and its methods are radically opposed to the aims and methods of capitalism and class society.